If you're thinking that you haven't got much if any, swiftwater on your patch and that this book is not applicable to you THINK AGAIN Swiftwater rescue (the discipline, not this book) is probably second only to confined spaces incidents for badly mismanaged rescues purely because many fire services departments are forced to take on the responsibility for such infrequent occurrences without fully understanding what they're letting themselves in for. In the US specialists like Slim Ray, Les Bechdel, and Jim Segerstrom together with a number of appropriate training agencies have been addressing the problems of aquatic rescue in general and swiftwater in particular for a number of years and awareness of the risks is therefore much greater there than in most other areas of the world. It's a changing climate with floods seeming to be an ever increasing risk and although this book is aimed at the 'rescue professional' implying some degree of water competence it is going to be rescuers with little or no experience of water rescue who will gain most from this excellent publication. So, cards on the table, this is not a review in the sense of the book being good or bad because it would be difficult to question the credentials of the author. You could maybe say that it's points haven't been adequately put across or that something has been missed or that the illustrations weren't particularly good but that's not the case here. Slim has come up with a goldmine of information in a well presented and comprehensive package, which could only really be improved by adding a lot of color photos and illustrations instead of black & white, but their you'd have to pay more. Swiftwater is only one aspect of aquatic rescue but it is the one which requires most preplanning, training and equipping if a rescue is to have a satisfactory outcome. It is certainly not prudent for your organization to buy some throwlines and some buoyancy and hope to muddle through when your water hazards become fast moving water hazards. Read this book and you will at least be more aware of your shortcomings and how they might be addressed. A brief opening chapter sets the scene and is followed by a vital chapter on Hydrology. This is the sort of stuff that really good white water kayakers and rafters have learnt over the years often through bitter experience but fledgling rescue services need to take on board more rapidly. Identification of the features in a fast moving body of water and how to manoeuvre into or around them is well documented here. A sobering fatal incident is recounted in the book's prologue in which simply identifying the difference between a breaking wave and a hydraulic wave was all that stood between success and failure. Illustrations abound and whenever you think of a question it seems to be answered a little further on. After an introduction to water rescue equipment we move onto 3 chapters covering rigging. Rigging is now a key part of the whole Swiftwater program and is covered so well that rope rescue specialists can brush up on one or two things. The style is reminiscent of Tom Vines' High Angle Rescue but in actual fact (in the absence of an updated version of that very good publication) goes a bit further in, areas such as anchor rigging, haul systems, and new equipment. This discipline very obviously requires a marriage between advanced rope skills and advanced aquatic skills as well as a host of interrelated areas such as working with (or without!) helicopters, a subject dealt with in detail later in the book. The physical action of rescuing is covered in 3 chapters covering rescue from shore, from within the water and using a boat. These bring together some of the points learned in the hydrology chapter with a further recap bringing it all together in a chapter entitled Special Situations, This chapter should have been titled 'Specific Situations' because it suggests precisely what should be done in the most likely situations like a vehicle in mid stream or a victim trapped in a low head dam. These are the things you really wanted to know when you first picked up the book but unless you've taken in what has been said in all the preceding chapters this 'how to' chapter taken in isolation during a general skim through will get you into trouble. 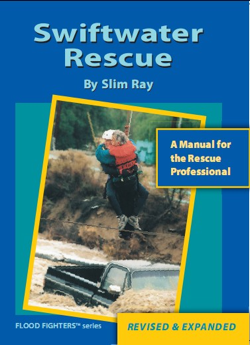 The book doesn't end at chapter 15 because there are 20 or so pages of additional information: an analysis of what went wrong at the San Marcos Incident related in the prologue; a description and illustration of each of the most common rescue helicopters; a Death Investigation Checklist; Rescue 3's Low Head Dam Rating System; River Safety Lecture-again from training organization Rescue 3 this gives an idea of the direction and content of a safety lecture and finally a glossary and Bibliography. Swiftwater Rescue is a must for anyone with so much as a drainage ditch on their patch. Excerpt from Chapter 1: Water rescue is a huge field. It includes swiftwater, lake rescue, surf and off-shore rescue, ice rescue, underwater rescue, and much more. A very common mistake is to think that because you are expert in one of these areas that you are expert in them all. Swiftwater rescue, however, is a unique field, very unlike other water rescue specialty areas. What is swiftwater? The answer seems deceptively simple: water moving downhill. Yet, when water begins to move, it makes its own rules. The learning curve in swiftwater is steep and abrupt, and often there is no chance to retake the test. Many would-be rescuers have paid for this ignorance with their lives. BACK COVER: Firefighters, park rangers, search and rescue squad members, EMS administrators, and anyone whose public safety duties include river, flood or swiftwater rescues will find this densely illustrated, fact-filled book to be of tremendous value. It is written to save lives-yours and your team mates as well as those of the people you rescue. Swiftwater rescue is one of the most dangerous types of technical rescue-this book shows you how to stay alive and succeed.  What special equipment you need for swiftwater rescue, including individual and team gear and personal protective equipment.  Rigging for river rescue, including basics like haul systems and anchors as well as advanced techniques like high lines and tethered boat lowers.  Boat-based and in-water rescues.  How to use helicopters for swiftwater rescues, including employment considerations, short hauls, hoist operations and rescue swimmers.  How to deal with special situations like flood channel rescues, cars in the water, and foot and body entrapments.  Medical considerations for river and flood rescue.